The RSV - The Translation by Which all Others are Measured! Now Includes The Apocrypha. The Revised Standard Version Bible, translated from the original Scriptures, debuted in 1952 to widespread acclaim. It was subsequently adopted by a spectrum of denominations the world over for use as a text in both public worship and private devotional settings. The RSV dramatically shaped the course of English Bible translation work in the latter half of the Twentieth Century. It remains the Bible of choice for many people, and has become a benchmark for comparison to other English Bibles. I recently added the Revised Standard Version (RSV) for e-Sword to my digital Bible library. I am very pleased with it. This is an excellent e-edition of the RSV, and I find it a joy to read. The Bible I purchased included an add-on from the free version. At first, I couldn’t figure out how to access it. After contacting “help” - Rick replied very quickly with the answer. Great service! I use it frequently to translate from the Complete Jewish Bible I'm currently reading through. I am so glad this is available. I love this translation but it isn't out there much now. Smooth, no problems loading. Good version. I have had a hard copy of the RSV since March 1969 and it has served me well as a second to my KJV. However, as I have gotten older - in my 70's - my eyesight is not as good as it was. Having e-Sword is a blessing and having the ability to now use the RSV for my typed studies is great. Thank you for making it available. Fully recommended! I love this version because some of the scripture is easer for people to understand especially when at a young child's death in a family you can quote Isaiah 57:1-2 and it gives them a lot of comfort. Thank you for all the trouble you go through to get the word into many hands. RSV for E-Sword installed easily and works flawlessly. 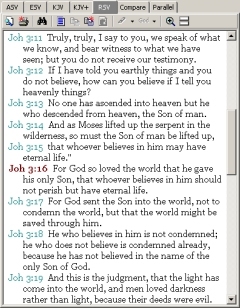 I use it to assist in writing sermons and preparing lessons. The price was quite reasonable. I have found E-Sword a valuable resource. The RSV isnt bad, but I prefer the NKJV. Through the years I have found some of my favorite Christian writers quote from the RSV. I actually study several versions and while I have learned of their shortcomings, I find myself returning primarily to the RSV for two main reasons: 1) It really hits the mark on passages that are important to me, and 2) the overall flow of the wording reads well. I originally got mine in a Harper Study Bible back in 1981, and now that I have the RSV inside of e-Sword, I'm quite happy. I find the integration of the different units to be more helpful than I had hoped for. I find it very easy to quickly search for passages and then to annotate and cut and paste into other documents I am working on at the time. I purchased this item to give me a greater depth of study and am very pleased with it. It has given me a new insight into phrases and verses that I was already familiar with and brought out the significance of others. Highly recommend especially with the Vincent Word studies commentary. I was very pleased to get this version of the Bible at a reasonable price. It is easy to read and understand, and the Apocrypha is referred to when some of my studies quote from it.